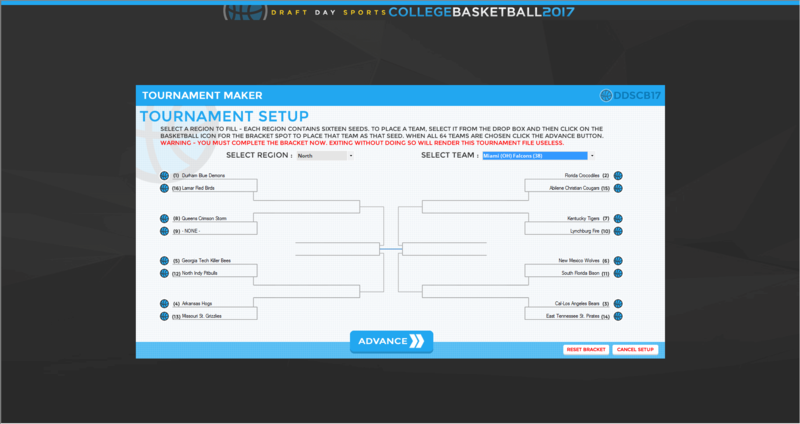 March is just around the corner and sports fans know that can mean only one thing…its tournament time, baby! So the big question is what’s new for Draft Day Sports: College Basketball 2017? Before we dive into the new features let’s talk about some upgrades. 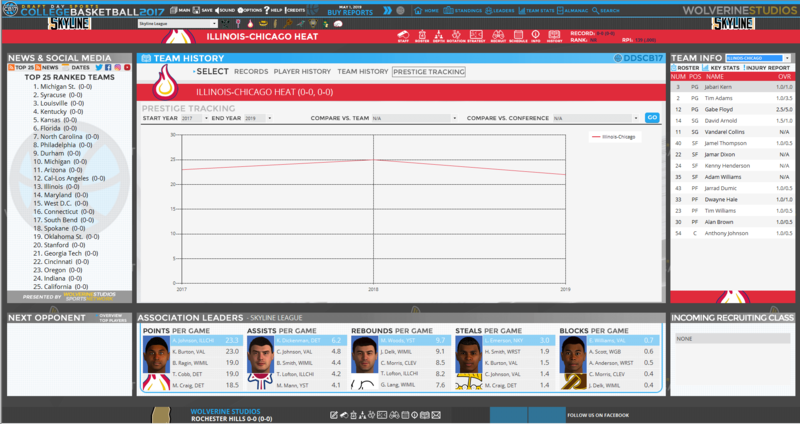 We’ve upgraded the AI to make teams even better at recruiting – especially transfer and JUCO players and we’ve also given you sliders to control the amount of injuries, the recruiting difficulty level and the threshold of patience level before you and other coaches get the boot as head coach! 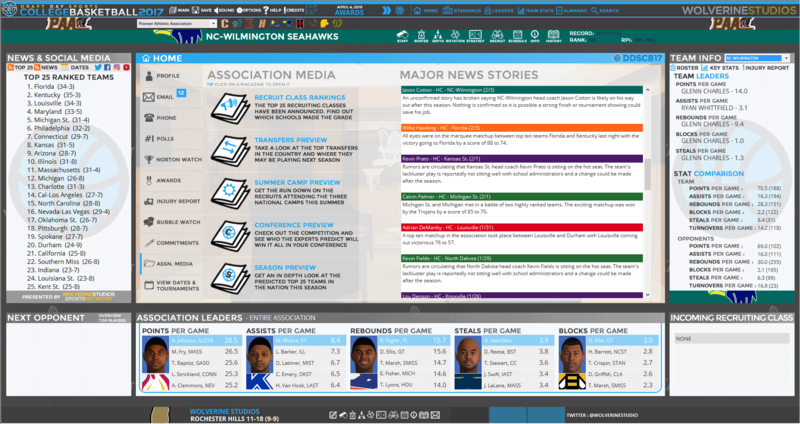 We’ve also upped the customization of your league – you can now edit most tournament info and even swap teams around conferences through the in-game commissioners office for more control over your game world. But that’s not even close to being all. Here’s an in-depth look at some of our favorite new features – all screen shots are shown at 1920×1017 resolution – smaller resolutions can play the game but may not see all the windows present. We’ve tweaked the UI to make navigation easier and faster. 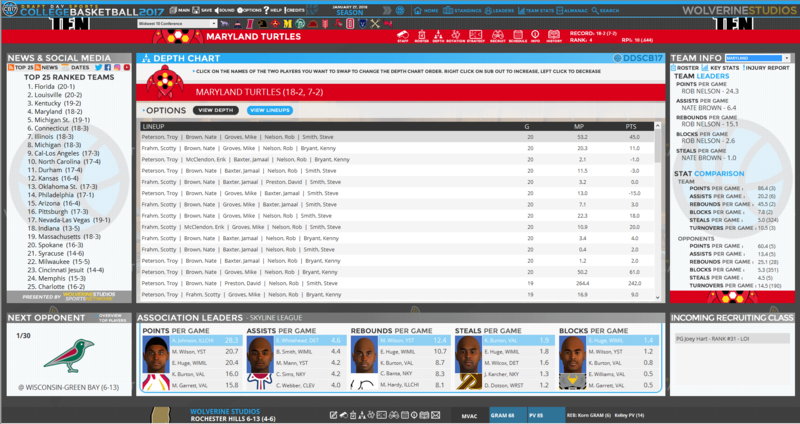 You’ll notice the new team menu bar at the top for you to quickly switch between teams and the expanded menu below it offering depth chart and sub matrix as their own destinations rather than accessing them through the roster page. We’ve also changed the bar at the bottom to include links to those same screens except that they always remain tied to your team so you can feel free to look through your association with the top menu and can always come back to your team pertinent info with one click. Brand new to the game is an exhibition mode we call Tournament Maker. 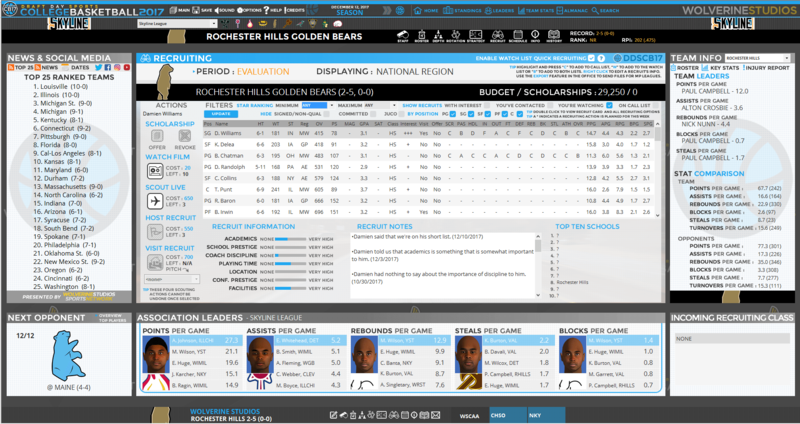 This feature allows you to take any one of your created associations and hold a 64 team exhibition tournament letting you sim out the results or play any and every game yourself. We didn’t leave all the new tournament fun for exhibition mode. Your season play now consists of a fourth post-season tournament as well as six brand new pre-season tournaments. Best of all we’ve given you both the ability to edit the names/logos for most of the pre-season tournaments and using the home office screen there is a new link for Tournaments & Dates which will give you a link to the above screen so that you can see a recap of all 14 pre-season tournaments at once. We know the job of recruiting can be a tough one so if you’re looking to move through it quicker without turning duties over to the AI we’re introducing “quick recruiting” – just simply add players to your watch list and activate the check box on the recruiting screen and you’ll be able to scroll through all the recruits you are watching and assign your weekly instructions right then and there without leaving to go to each individual recruit card. If you prefer the old method you simply don’t check the quick recruit option box and you will be able to double-click on the recruits to bring up their card and recruit from there. Nothing has been taken away – only added functionality to make the experience better for everyone! Did you ever wish you could look back and see just how far you’ve lead your team in the past decade? Well now you’ll be able to look at a graph of your team’s prestige throughout time as well as having the option to comparing it to any team you wish or even to a conference as a whole! 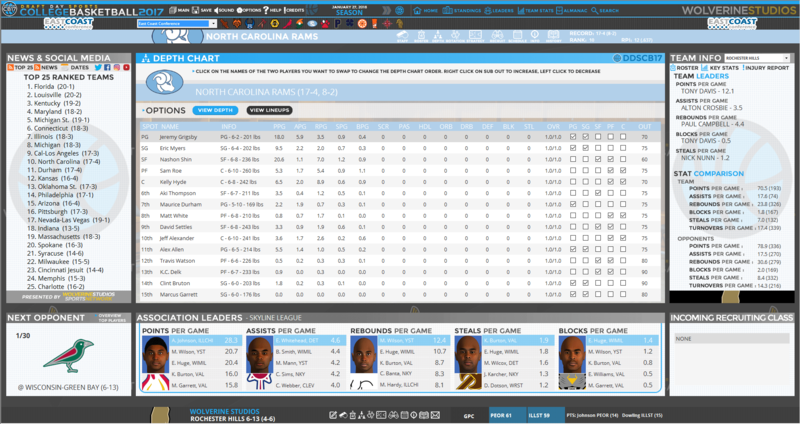 Stats are becoming more and more important in basketball and you need all the information you can get which is why we’ve included lineup tracking in DDS:CB 2017. Get a look at every lineup you use and see how effective each one is so you know exactly where to look for when its time to shake things up and make lineup adjustments! Every day you can get a daily news blurb on players from around the association but through the Media tab on the home office we’re introducing a season long recap of the biggest and best highlights. Look for stories on top matchups, outstanding performances and even which coaches are on the hot seat.